Company blog explaining the valuable insight as a result of harvest data. For a farmer, harvest season can be the busiest time of year. Add in the rain delays seen by much of the country this year, and things can become very chaotic. In these time-crunched periods, it is important for the producer to take the opportunity to properly capture their harvest data. It may seem like there is no extra time to spare, but the value gained from insight into ROI becomes priceless when making decisions for next season. This means calibrating your combine monitor before the season to make sure the data being collected is accurate. It is even important to re-calibrate midway through a season to make sure you are capturing consistent data. If the data being collected is not correct, the insights from analytics will be skewed. This can lead to misinformed decision making, and lack of true ROI understanding. With your monitor properly setup and calibrated, data will be generated and compiled as you make your way through harvest season. Combine monitors have a vast number of features, so the more you utilize the greater your insights will become. Having this data at the end of the season will provide you with a tool to help make proper decisions in the coming year. Having all this data is great, but value only comes when we can learn and improve our practices from the results. It can be easy to put away your combine at the end of the year and forget about harvest outputs until next season. My suggestion here would be to look over the data while it is still fresh in your mind. This allows you to add notes or comments to specific fields or areas needing additional data. For example, a combine monitor does not recognize the lower areas of the field produced poorly because a late spring frost caused damage. This is the type of information stemming directly from the knowledge of the producer. It can create as much value as the data coming directly from your combine monitor. By pairing a producer’s knowledge with the data generated from a combine, you get a true picture of production. Utilizing factors past the simple collection of yield data provides a more accurate model by taking into consideration reasons why yield outputs vary. 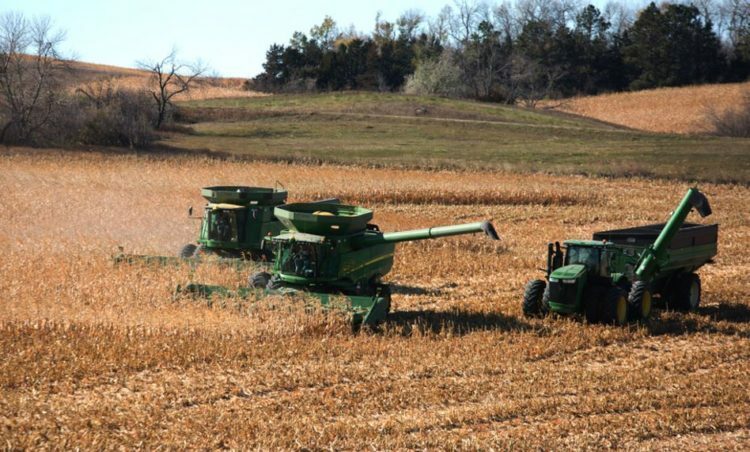 Looking at harvest data for the current year provides the farmer insight into the effectiveness of different applications, seed varieties, and many other practices. The true value comes when a farmer can look back multiple years to discover trends and make ROI predictions based on data. A combine monitor only has enough storage space for current year data at best. Where does this data go once it is cleared off your combine monitor? How can you store and gain value from previous years’ data? How can you compare harvest data with planting data? The answer is a warehouse to store, organize, and analyze your data. AgCinect is a data management solution capable of storing information from multiple growing seasons. This gives the producer a tool to manage their data for the current year as well as comparing it to previous season results. Even more beneficial is the ability to store both planting, spraying, and harvest data in one location. This allows you to get a complete picture of your entire operation for a true analysis.